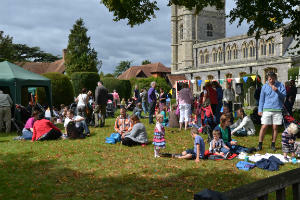 St Mary's community is a hub of activity - we are not just a church for Sundays. Different groups meet throughout the week. If you have just moved into the area and are looking for a church, or want to start worshipping in church for the first time, we hope that you will find these pages useful and get to know a little about us as a community here in Beaconsfield. Learn more about how you can become involved with our groups and activities. A variety of different house groups meet during the day and in the evenings to share fellowship and Bible Study. The Evening Group meets each month to listen to guest speakers in a social setting where all are welcome. Our Pastoral Team offer one to one support to those in need. Stewardship covers everything we do in God’s name within the church. It is not just about our financial giving, but also concerns the time we offer and the talents we bring. Friends of St Mary's provides a tangible link between the church and the community and at the same time broadens the base of support for the church beyond our immediate congregation.